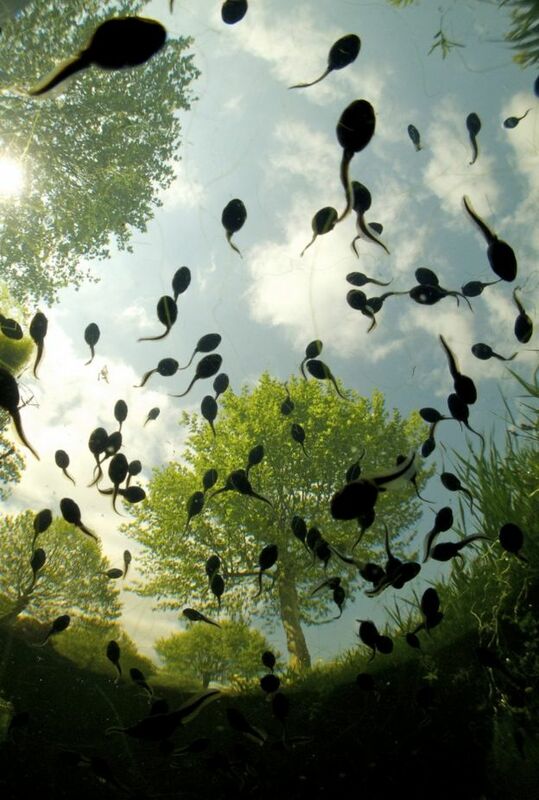 An underwater photo of a group of tadpoles silhouetted against a bright blue sky has won first place in the inaugural Royal Society Publishing photography competition. The photograph was taken by biologist Bert Willaert, while he was snorkelling in a canal in Belgium. He explained: “Clear water is hard to come across in the part of Belgium where I live, as a consequence of eutrophication. The competition received more than 1,000 entries, submitted for three categories. 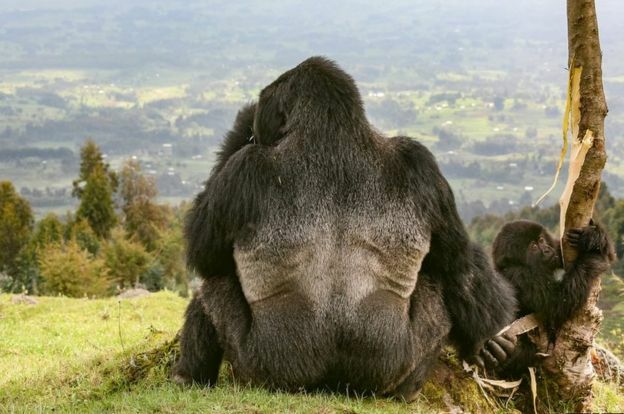 Runner-up for Ecology and Environmental Science was Martha M Robbins from Germany for her shot of a silverback gorilla near the Volcanoes National Park, Rwanda. 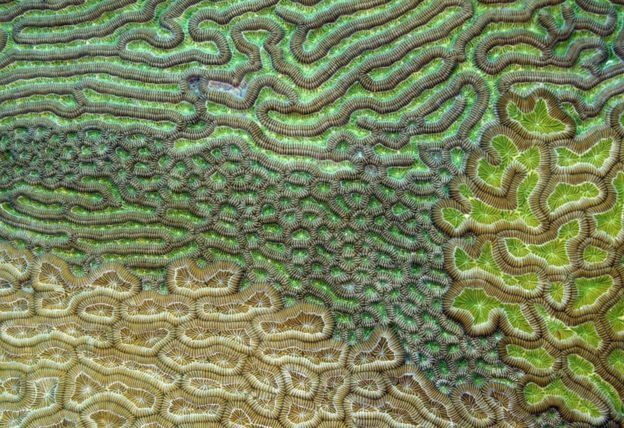 Evan D’Alessandro’s photo of Caribbean brain coral was specially commended – also in the Ecology and Environmental Science category. 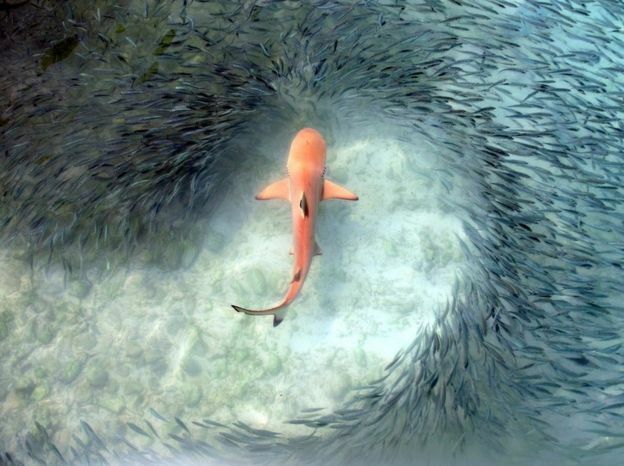 A school of tropical clupeid fish avoid a black-tip reef shark in Claudia Pogoreutz’s winning photo in the Behaviour category. 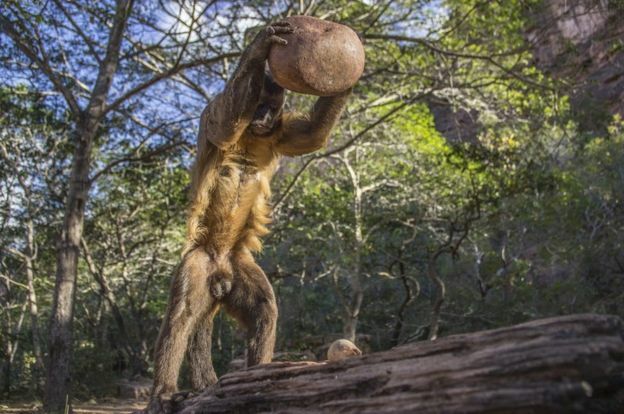 An adult wild bearded capuchin monkey (Sapajus libidinosus) uses a stone to crack a palm nut in Fazenda Boa Vista, Piaui, Brazil. 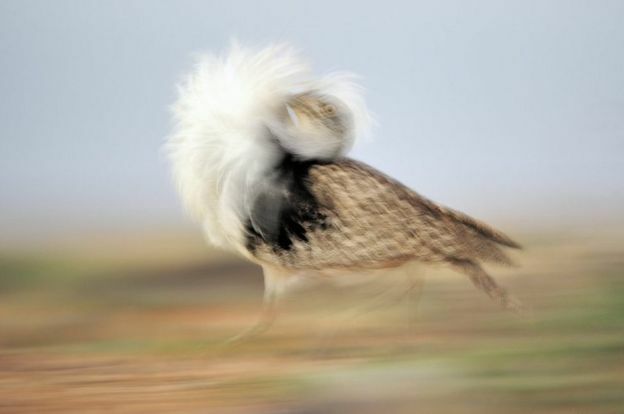 Taken by Luca Antonio Marino, the photo was runner-up in the Behaviour category. Specially commended and the Biology Letters publisher’s choice was this shot of a male Canarian Houbarabustard (Chlamydotis undulata) during an impressive courtship display, It was taken by Jose Juan Hernandez Martinez. 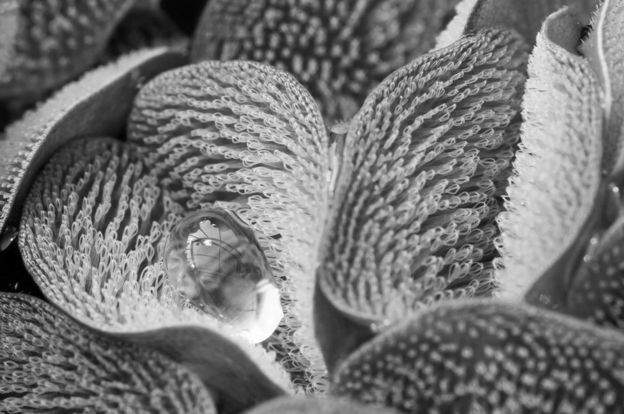 Ulrike Bauer triumphed in the Evolutionary Biology category with this image of the leaves of the water fern (Salvinia molesta) covered with whisk-like hairs. 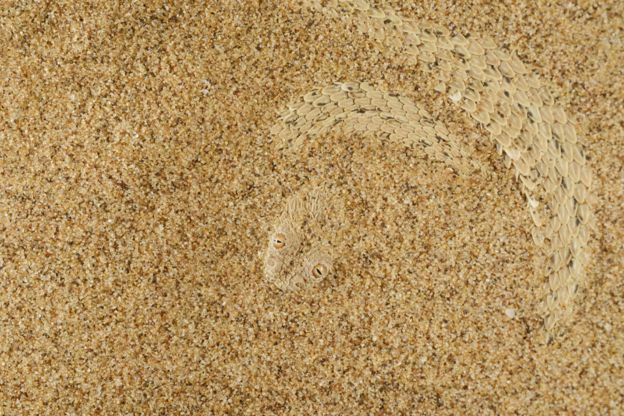 Runner-up spot for an Evolutionary Biology image went to Fabio Pupin for this photo of a Bitis peringueyi side-winding adder in the sand of the Namib desert. 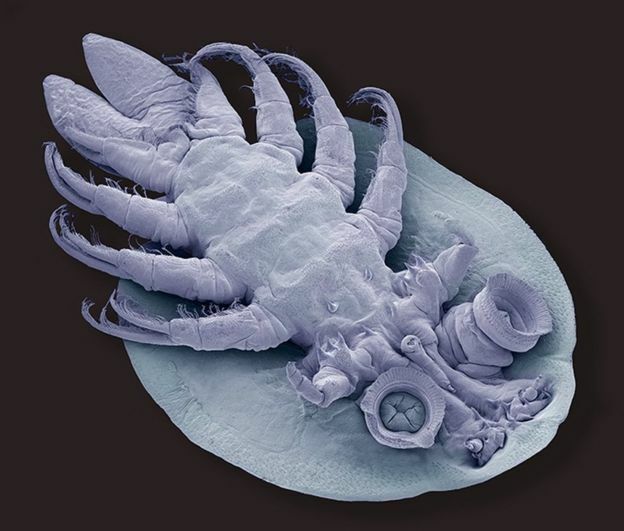 Fish louse by Steve Gschmeissner was specially commended for Evolutionary Biology. 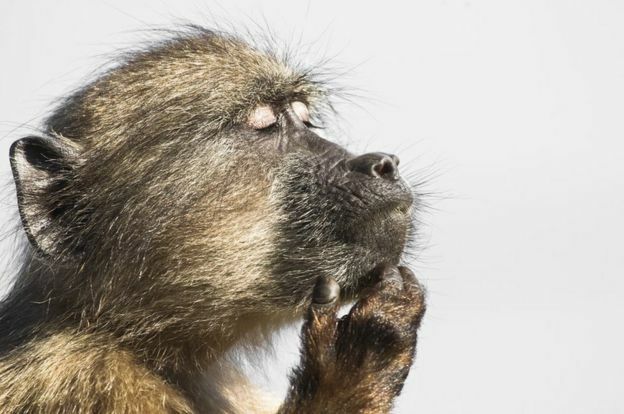 A baboon gets lost in his thoughts in another specially commended shot submitted for Evolutionary Biology, made by Davide Gaglio. The winning photo and all the runners-up will be on display at the Life through a lens exhibition at the Royal Society, London on 26 November.